While there is huge interest in solar water heating thanks to increased awareness of our impact on the environment and the surge in the costs of gas and electricity, there is often one major stumbling block – the hot water tank. 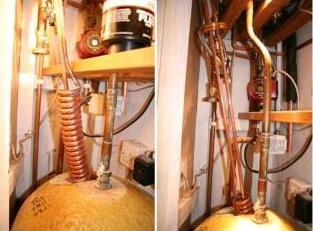 Dual coil hot water tanks are available, but they are expensive (as is the cost of removing the existing tank). It is of course possible to add a second hot water tank to a home for solar water heating, but this can also be expensive, complicated, and takes up space (which may not even be available). In this article we will introduce an affordable heat exchange coil which can easily be retro-fitted in an existing standard hot water tank to enable indirect solar water heating. 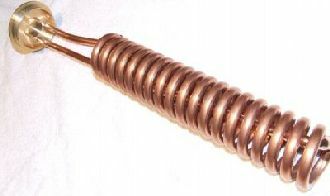 The product pictured above is an immersion coil heat exchanger. Unlike a standard immersion heater element which is heated by electricity, heated fluid passes through this immersion coil (without coming into contact with the water in the tank – i.e. indirect heating). If fluid (typically anti-freeze) heated to say 40 degrees Celcius is pumped through this coil of copper pipe, it will lose heat into a hot water tank filled with water at say 20 degrees Celcius. As the anti-freeze cools on its journey through the coil, the heat it loses is efficiently taken by the water in the tank. The anti-freeze leaving the heat exchanger could well emerge at 25 degrees (having lost 15 degrees), thereby heating the tank (which contains a much larger volume of water) by a fraction of a degree. If hot anti-freeze is continuously pumped through the coil then the temperature of the water in the tank will continue to increase. This type of heat exchanger is a commercial version of the type discussed in our article DIY Solar Water Heating Prototype. With this immersion coil heat exchanger, a solar water heating panel, a suitable circulation pump, and a simple pump controller, a very effective solar water heating system can be put together relatively inexpensively without the financial costs, trouble, and inconvenience of replacing the existing hot water tank. The only disadvantage of the coil as pictured is the depth it can reach into the hot water tank – 800mm. The water at the top of a hot water tank can be very hot when the water at the bottom is still cool. A standard immersion element is always fitted at the bottom of a hot water tank so that it heats all of the water in the tank. Fortunately these heat exchange coils can be ordered in custom lengths as required so it is worth requesting a longer one to maximise heating efficiency.. This heat exchanger is listed for sale on ebay UK by angels-with-wings for £69.99.